of the football season. This year, they will LIKELY begin after week 5 instead. I will do everything possible (within reason) to post week 3 and week 4, but make no promises. I may post them retroactively after week 5. Please do not beg or offer to help. The process is complicated enough that, frankly, I trust nobody else to handle taking it over while I am out of the country. Thank you for your patience and understanding. Huge thanks to "AuldSchool", who developed a formula which picks winners for every week-9 game in the state, then calculates approximate playoff points for every team. Those approximated points and win-loss totals are used to select the teams included in these projections. To see the list of chosen teams, sorted by enrollment, and to discuss the process or ask questions, CLICK HERE. To see the list of chosen teams and to discuss the process or ask questions, CLICK HERE. There is no "Favorites Win" projection for eight-man. The projection below is the same as Week 8. For all the 8-man information you can handle, and then some, CLICK HERE. 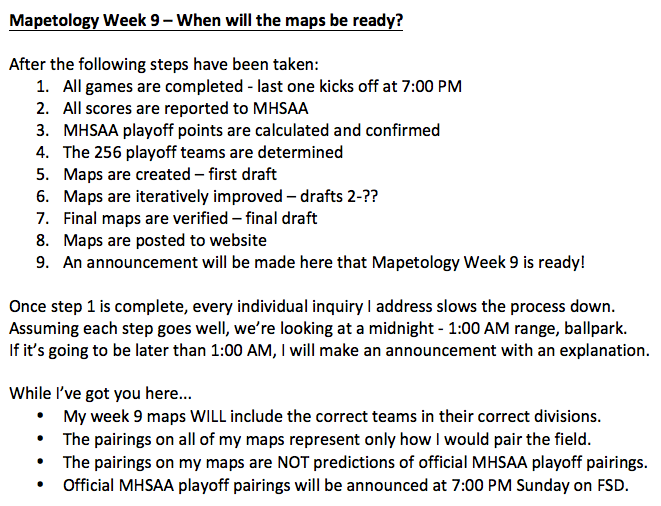 Huge thanks to "Mr NCAA", who developed a formula which picks winners for every week-9 8-man game in the state, then calculates approximate playoff points for every team. Those estimated points and win/loss totals are used to select the teams included in these projections. The pairings were also done by "Mr NCAA". Special thanks to "Mr NCAA", who did the pairings for the Eight-Man division.